Drop-Down Menu Trees is an application that can come in very useful to create your website. It is a tool that will help you to create the menu of your web, so as to make it easier to order and simplify the internal navigation. If there is a lot of of hierarchic contents in a website, it may be complicated to create a clear structure that has a logic and simple navigation system. Drop-Down Menu Trees makes the task of creating these menus easier. When you create a website it is very important for the user to know at all times where and how to find the contents that they look for. That is the main reason to provide importance to the hierarchic structure of the browsing menu to make it clear and intuitive. 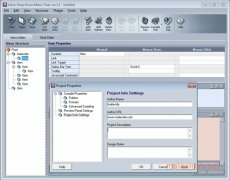 Drop-Down Menu Trees allows to create these menus from scratch in the most simple way, for any user without the need to be an expert. Drop-Down Menu Trees allows to choose between various preset branched menu themes, so that you can select the one that adapts best to the style of your website. What's more, you will be able to customize each theme to your own liking. By means of a clear interface you will be able to create the hierarchic structure of the page in the most simple way. 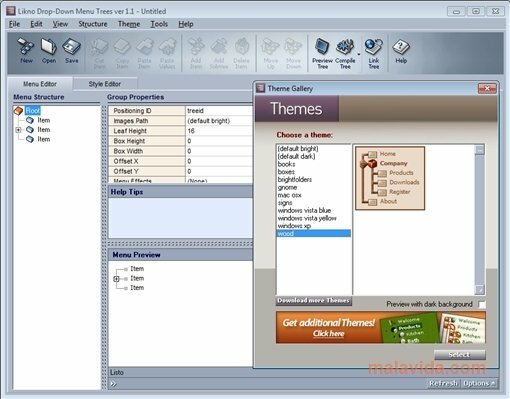 Try Drop-Down Menu Trees and you will be able to create your own menus without any problems. 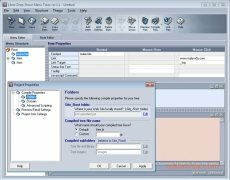 The trial version doesn't allow to publish the menus created with it.